To all my readers who have always dreamed of gracing the covers of car magazines, walking through the pits at international car races, or have just wanted to show off your beauty in Japan, I found just the thing for you! =D Read on! 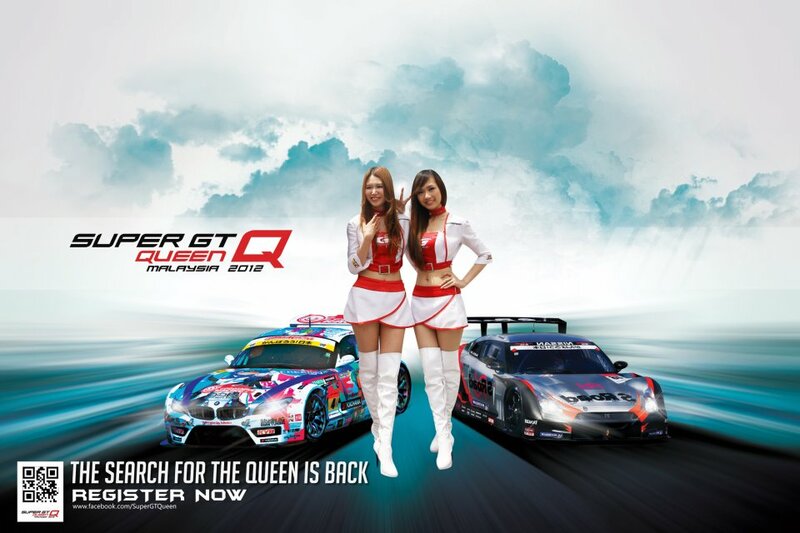 Super GT fever has begun, and along with it, the Super GT Queen search is also back, with the most exciting prizes yet! Has being a race queen always been the ultimate dream? Well fret not; your chance to show us what you’ve got is here, with the chance to represent Malaysia in GT Japan! The winner of this year’s Super GT Queen will have the chance to become the new ambassador to represent Super GT Malaysia to Super GT Japan in 2013! Other than the exclusive honour of being the Malaysian face in Japan, prizes worth a total of RM60, 000 .00 will also be awarded to the winner. The Super GT Queen search is looking for girls who are not only beautiful on the outside, but also girls who possess other talents, such as singing or dancing, and who excel at public speaking. So who knows? Your hidden talent may very well be your ticket to Japan! All female Malaysians who are within the age group of 18 to 25 years old, and who stand at a minimum height of 165cm are encouraged to apply. . The top 30 finalists will be selected through a nationwide recruitment in shopping malls and universities or colleges, starting on the 24th of March. During the Semi Final, however, only the top 15 finalists will be selected to continue through to the Grand Finale, which will be held in the Sepang International Circuit on the 9th of June. The lucky top 15 finalists will be put through a 1 month intensive training course which will include grooming, public speaking, posing, catwalk, dancing, fitness training, make up & hairdo tips, etc. This year, we are honoured to have the founder of Simone Models; Ms Simone Teh as not only one of our judges, but also our catwalk trainer. Ms Simone has trained big names in the modelling industry, such as Gwen Loo, Rain, Shir (I Wanna Be A Model Female Winner), Cassandra Patrick (Miss Malaysia Tourism Queen International 09/10), and Belle (Miss Astro Chinese International 2009). Other than Ms Simone, we have an exciting line-up of celebrity judges, such as international race queen Leng Yein, and actress Lavin Seow. Apart from the top honour of becoming the Super GT Queen of 2012, contestants will also vie for subsidiary titles such as Miss Congeniality, Most Photogenic, Most Talented, and Miss Leisure Travel. More than 100 photographers, bloggers and other media outlets will be promoting the event, giving all our participants tremendous publicity and exposure. The Super GT Queen search is going to create a big impact and is set to become the most exciting event in town once again! So what are you waiting for? Like the Super GT Queen facebook page https://www.facebook.com/SuperGTQueen and fill in the application form now! You can also send your profile and pictures to register@supergtqueen.com or register at www.SuperGTQueen.com, or even call us on our hotline at 013-504 1134. The first audition will be held on 24 March 2012 (Saturday), at Tropicana City Mall from 2pm to 5pm. sounds exciting.. too bad I'm not too into it. I'm only in Japan :P Nice post you it on. Hopefully more people will read this post of yours and help to spread the news! Thanks for posting the photo, tapped into a bit of a weakness of mine. A.B. Haha.. I'm into Japan as well, big time! ;p If only they'd let me tag along when they go.. lol..